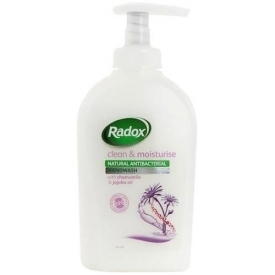 Radox Clean & Moist Handwash contains active natural ingredients to make this natural antibacterial handwash, which is effective yet gentle. Radox Clean & Moist with naturally conditioning jojoba oil, which helps keep skin soft and smooth, is blended with light and caring chamomile, keeping hands clean and moisturised. I love this handwash, I wash my hands so much and I have tried lots of different handwashes, but this one really is lovely, it is thick and creamy, lathers up nicely, it has the anti-bacterial properties I want, but there is none of the harshness that some handwashes have. My hands are sensitive from washing them, they were in a really bad way, cracked and red, they still are a bit dry and a bit sore, but that's due to the amount of times I wash them, this handwash keeps them relatively soft and moisturised though and no other handwash is quite as good at keeping my hands in decent condition. I love the smell of this one too, and its got a low price tag, its great. A gentle, effective, moisturising handwash which is suitable for everyone. A really good moisturising hand wash it smells great and doesnt leave your hands dried out. It s also a great price . Really like this as its mild and gentle on skin.